Twelve year old “Eco” Erek Hansen is putting his best foot forward, and has gone on a one-boy mission to divert thousands of shoes from our landfills. The Ohio kid has been organizing shoe drives in his home town, collecting cast off sneaks and turning them over to clothing recycler USAgain. Rather than playing video games, the inspiring tween spends his free time reducing his carbon footprint. Each year over 300 million pairs of shoes are thrown into United States landfills, an unnecessary waste in the eyes of Hansen. He and his mother drove the 4,000 pairs of shoes he collected all the way to West Chicago, to the USAgain clothing recycling facility, who gladly accepted the donation and slated it for recycling into other products. Along with recycling the shoes, the company also made a $1,000 donation on Hansen’s behalf to an environmental clean up non-profit. Hansen’s collected shoes will either be reused by the underprivileged, or recycled. Unusable shoes can be transformed into running tracks, tennis courts or soft playground surfaces by grinding them up. Aside from collecting old shoes, Hansen also recycles old jeans, creating a denim drive just as big as his shoe collecting. Even though his 8,000 shoe donation has been turned over to USAgain, he doesn’t plan to stop there. The Ohio kid plans to start the process over in his home town, and has even started a website so interested parties can donate their old shoes to Hansen’s cause. 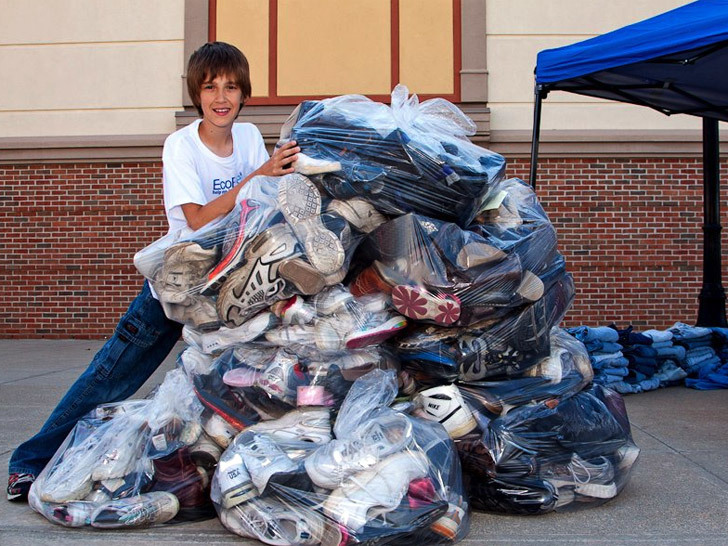 Twelve year old �Eco� Erek Hansen is putting his best foot forward, and has gone on a one-boy mission to divert thousands of shoes from our landfills. The Ohio kid has been organizing shoe drives in his home town, collecting cast off sneaks and turning them over to clothing recycler USAgain. 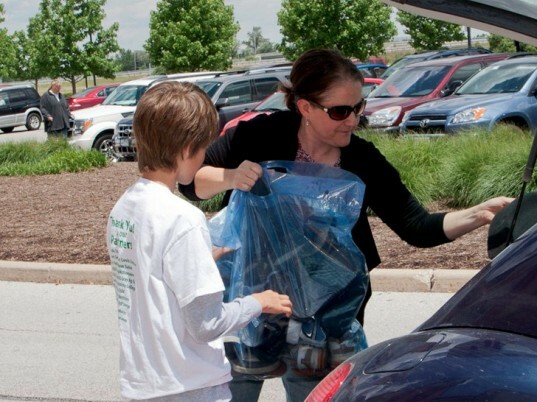 Rather than playing video games, the inspiring tween spends his free time reducing his carbon footprint.